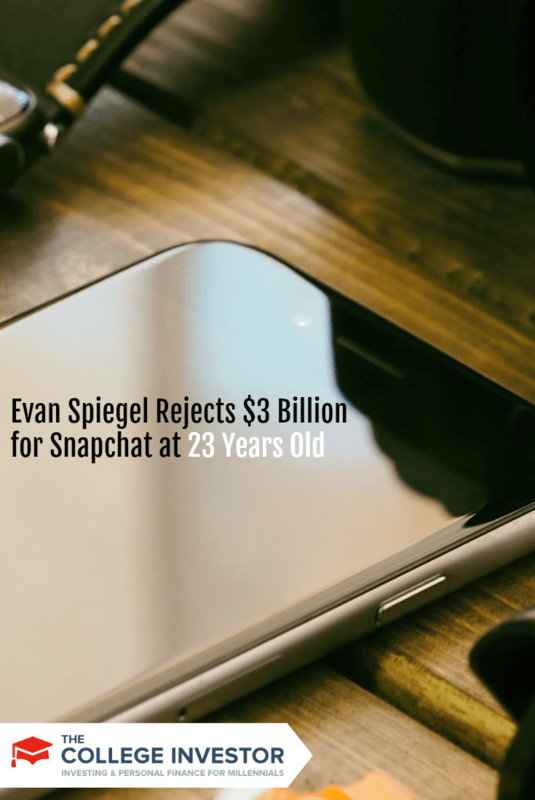 You may or may not have heard the news: Evan Spiegel, at 23 years old, recently turned down a $3 billion offer to acquire his company. The co-founder of Snapchat was reportedly approached by Facebook (NASDAQ: FB), but declined their offer and is now back to work on his revenue-less company, with no foreseeable business model. Snapchat is an app developed by students of Stanford University, which allows users (who are mostly teenagers) to send photos, videos, and other media among themselves. However, their messages are referred to as “Snaps,” which are viewable for up to 10 seconds. Users set time limits themselves, after which the Snaps are removed from both other users’ devices and Snapchat’s server. In contrast, content on Facebook is largely timeless, unless users literally delete each one of their photos, videos, and other files one-by-one. The company did try to replicate Snapchat’s success with “Facebook Poke,” but this was not nearly as successful, hence the $3 billion offer. To put this into perspective, Facebook paid $1 billion for Instagram, which was also revenue-less at the time. In fact, it has been reported that Facebook originally offered $1 billion for Snapchat too. But even after apparently offering $3 billion, Spiegel won’t budge. Why would Facebook want to pay such an amount though, anyway? Is Facebook showing signs of desperation? Until Instagram, Facebook’s strategy for mobile basically consisted of getting Facebook onto mobiles. But desktop and mobile and very different animals. People pick up their phones all the time and their minds are focused more on intimate sharing. Mobile requires a different business model and Facebook is best-suited to desktop, so acquisitions of mobile-focused solutions make sense. Now, Facebook has announced they will serve ads on the Instagram platform. Although Snapchat isn’t making money, Facebook does need to reinvent its mobile strategy and business model — Snapchat might have seemed like a good way to start that reinvention. Typical mobile behaviors point toward useful, relevant local advertising rather than “like” buttons. While Facebook’s mobile offerings aren’t exactly failing, they mentioned in October that users aren’t going to their applications quite as often. Google is big in the mobile arena; can Facebook even compete? Facebook serves a purpose for reconnecting people with their old friends, or simply connecting friends with their current social circle. Mobile is different though; it is far more intimate and your mobile contacts typically consist of people you know in real life, who you see and speak to on a regular basis. Your interactions with these people are quicker, snappier (no pun intended), and ultimately more meaningful. Plus, one review from a close friend is worth more than 10, 50, or even 100 reviews from people someone sees a couple of times per year. Snapchat has strong potential for monetization, but it’s also new and has that “cool factor.” Facebook wants it all. Evan Spiegel: Shrewd or Stupid? Stupid, probably. $3 billion is a lot of money, especially for something that does not even make money. However, Mark Zuckerberg was offered $1 billion for Facebook from Yahoo back in the day and the company is now worth well over 100x that amount. Of course, in order to reject an acquisition offer, you have to believe that your company is worth more than the proposed amount, but could a revenue-less app really go for more than $3 billion? Perhaps Facebook will come back with another offer, desperate to get in on the action. However, there are other big boys in the industry, namely Google. This mammoth of a technology company, which is currently very prominent in the mobile space, could very well splash some cash on Snapchat. This could be one reason why Facebook is making such extravagant offers: it wants to keep Snapchat from its major competitors. Spiegel is probably hoping to position the company for a future sale, but wants to try and hold out a little longer until his brainchild receives an even larger valuation, which may or may not happen. The problem is that not all tech companies get those larger valuations. Digg was sold for $500,000, but was once supposed to be worth around $200 million. Myspace was bought for almost $600 million by News Corporation, but later sold for apparently $35 million years later to Specific Media, after Facebook showed up to steal the show. All in all, Snapchat is just an app. One could certainly argue that Spiegel’s rejection was sheer stupidity, but perhaps he will get lucky and prove his shrewdness later on. The mobile space has seen rapid growth all-around and many other fast-growing apps are likely to emerge, just like Snapchat. The company was founded in 2011 and is now supposedly worth $3 billion two years later. If more apps show up just as quickly, Facebook won’t have the resources to acquire them all. It will be interesting to see if Snapchat just manages to keep up with its explosive growth. If you’re interested in tech startups, this is certainly a company to keep an eye on . . . assuming it lasts longer than 10 seconds, of course. What are your thoughts? Should Snapchat have accepted the Facebook offer? Matthew is a student currently studying Accounting and Economics. He is mainly interested in business, economics and finance. He enjoys watching CNBC and studying the financial information of various companies while also managing his own small live and virtual portfolios. If I was given an offer for $3 billion I would not hesitate especially if it’s a revenuless model. I recall the owners of Instgram being bought out for $1 billion however the current valuation is $16 billion. I guess only time can tell whether the 23 year old made the right decision, I admire the young mans conviction and hope him much success. This is an excellent post, thanks for sharing. I would have taken the money and run. I don’t know how Snapchat could be worth more than $3 Billion! I agree with you on that Michelle! I can imagine that this type of situation would be very difficult to be in. On one had you have a $3B offer on the table. On the other hand you might not have any ideas nearly as good as the one your could sell. Do we know how much of snapchat Evan owns? I’m guessing he owns a lot of it – and I would have taken the money as well! They don’t make any money – even if he walked away with several $100 million, he’s set.